Go bush walking in any dry forest or heath in Tasmania and it is unlikely that one will miss spotting the Prickly Box (Bursaria spinosa). It is one of the most ubiquitous of Tasmania’s dry forest shrubs. The Prickly Box is also an attractive plant with great potential for native gardening or bonsai-ing. While it is probably hard for those uninitiated in botany to guess what the Prickly Box might be related to, those with an eye for ornamentals might find the Prickly Box resembling Privets (Lingustrum spp.) or Box trees (Buxus spp.). Surprisingly, however, the Prickly Box belongs to the Pittosporaceae, making it a relative of the commonly cultivated Sweet Pittosporum (Pittosporum undulatum). 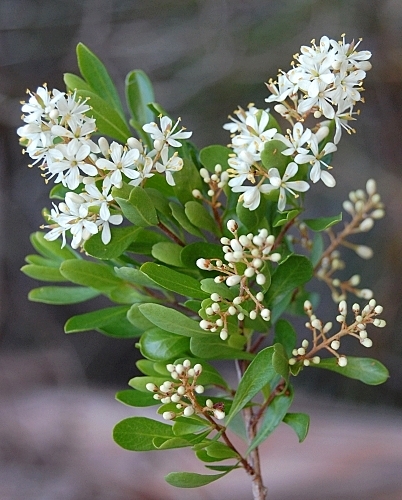 Unobtrusively, this native shrub has made it’s way into health shops. As part of a gradual move toward healthier living and eating, my partner and I visited one such health store in town, Goulds Naturopathica. 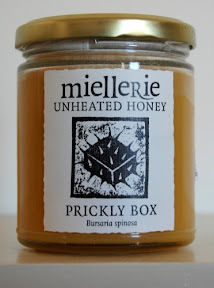 Whilst browsing through vials of essential oils and packets of herbal teas, I spotted a jar of miellerie honey on the shelves and the words “Prickly Box” caught my attention. I bought the jar on the spot. Upon getting home, I wasted no time in trying out my purchase. Plunging a teaspoon into the jar, I was surprised at the consistency of the honey — it was hard like frozen butter. 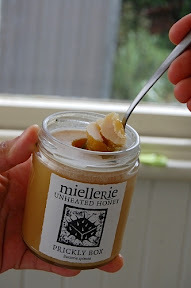 Certainly not your average honey on which you can use a honey dipper! I ate a small piece and I must say it is among the most fragrant of honeys I have ever tasted, way exceeding y expectations and better than some of the best leatherwood honey I’ve sampled. With the spoonful of honey chunks I made a mug of honey beverage and was duly impressed at the superb taste. As the honey is organic (I don’t know of any Prickly Box plantations anyways), it’s a little pricey, but it is definitely worth trying! This entry was posted in Bush Tucker, Honey and tagged Bursaria, Bursaria spinosa, miellerie, organic honey, Pittosporacae, Prickly Box, Prickly Box honey. Bookmark the permalink. I have been eating prickly box honey for several years.. Wynyard apiarist Leon Bugg (64421701) sells it regularly at the Foreshore Market. First and third Sundays of the month. Price: 1 kg for $8.50. Must agree the fragrance is very floral.